8:30am - Day five of Suwannee cooter fieldwork continues. This morning George is giving a presentation to the Sun City Center Audubon Club on our work surveying the distribution of Suwannee cooters in the southern portion of their range. We always use forums such as this to disseminate our research findings. As conservation ecologists, our research outcomes have real-world implications for species and getting this information out to as many stakeholders as possible is imperative. 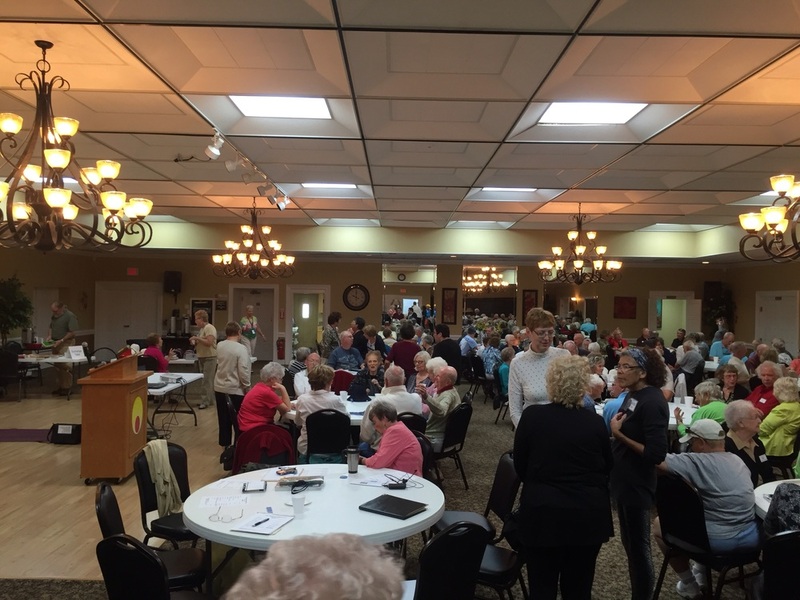 George's presentation was attended by around 150 members of the Audubon club. After George's presentation we will be heading back to the Little Manatee River at the nature camp, Camp Bayou. There we hope to speak to the staff about Suwannee cooters and see if they have any evidence of this species' presence on the river. Many times users of camps and nature centers such as this bring in bioartifacts such as turtle shells they find along the shoreline. We will walk trails along the river in hopes of spotting basking turtles. We will also hike trails in hammocks and uplands in hopes of observing Florida box turtles and gopher tortoises. Examining turtle shells at the Camp Bayou nature center. Camp Bayou is a small county-run park with little financial resources. The facilities are sparse but it it utilized well by the locals. We found two curious shells in their specimen room. One was an adult map turtle (species unknown) and a shell of a large cooter that looked like a hybrid between a peninsula and a Suwannee. Unfortunately the staff said many time people just drop off items with no information; so there is no guarantee that either came from the river. The map turtle could make an interesting note if we new it was found here. It is not native to here and could have been a released pet. George spotted a large female common map turtle on one of his trips to the Alafia River which was most certainly an intentional release. Small outbuilding housing fossil displays. The park's treasures are two out buildings with Florida fossil displays. Florida has a rich fossil history and numerous finds are unearthed in phosphate mines especially. Various mammal fossils found in Florida. 3:00pm - On the way home I spotted a Florida softshell turtle walking through a shallow ditch and we were able to pull over the truck to photograph it. This is a species that can adapt quite well to urban areas. Adult male Florida softshell turtle captured in a shallow ditch.